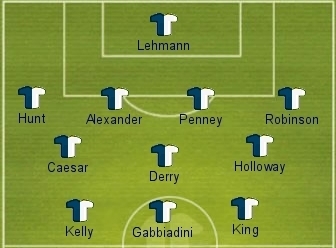 For any Bristol City fan of a certain age, any of the Bristol Rovers team from late ‘80s/early ‘90s could have made this XI – a team that not only seemed to beat us every time we met, but played an aggressive, nasty, direct style of football straight out of the Charlie Hughes School of Tactics, and then pipped us to the Division 3 title in the penultimate match of the 89/90 season with a 3-0 win. I’ve managed to restrict myself to the two ‘Gasheads’ who epitomised that team most. Aside from the fact he was a German ‘keeper who saved the odd penalty – a characteristic certain to rile any English football fan, Lehmann was one of these players who never seems happy unless he’s whinging or moaning about something. Beckoning the referee to caution opposition players, running 40 yards to get involved in a brawl, aiming vitriol at ball-boys for holding onto the ball too long are all reasons enough to include him in this XI, but for me it was his incessant time-wasting and lack of general sportsmanship that sealed his spot. Signed by Steve Coppell at the start of the 2010-11 season, Hunt was touted by many (including this writer) as potentially a more important signing than the glamourous, marquee-signing of England goalkeeper David James. Here was a solid defender with decent Premier League experience who could establish himself at right-back and lead the rest of the defence. How wrong we were! From day one he looked slow, lacking in anticipation and generally dis-interested. Two particular moments in an early-season evening game at Ashton Gate stand out, where the bottling out of a header and a 50/50 challenge near the touchline in front of the normally placid Williams Stand was the final straw. So bad, and so unpopular that questions were asked of manager and chairman at the AGM as to how quickly we could get rid of him – and they answered them! The first of the Gas (Rovers) team from the 1980’s, the best way I can describe Ian Alexander is to compare him with Gary Neville to Liverpool fans, but even more abrasive, aggressive and he had one of those stupid little moustaches that were so popular 25 years ago! Only 5ft 8in, he made up for his lack of height by regularly kicking lumps out of City’s more talented left-wingers, Alan Walsh & Dave Smith throughout his eight years in the north of Bristol (and Bath!). In today’s game he would have been sent off almost every time a derby match came along – in those days he managed to escape with only a couple of red cards, and numerous cautions. Gus makes the team on the basis of being probably the worst player to ever pull on a City shirt. Signed from Arsenal, he has often been named as their worst-ever player, largely as a result of a dreadful mis-kick in the 1988 League Cup Final that led to an equalising goal for Luton when Arsenal were leading 2-1; they went on to lose 3-2. He was also named number three in a 2007 survey for the worst players to ever play in the top-flight…..and we signed him! Gus made only 10 full starts before it became readily apparent to all that he simply wasn’t cut out to make it, and following a few short spells elsewhere, quickly disappeared from view. Another relatively short full-back (maybe there’s a size issue here? ), his thuggish and unnecessarily violent behaviour has caused serious injuries throughout his career, most notably Birmingham’s Damian Johnson who had his jaw fractured in two places following a close encounter with Robinson’s elbow, and, a little further back in history, Stewart Talbot, who successfully sued Robinson and Watford following ten months on the sidelines after a typically horrific Robinson tackle. The fact that he’s the first person on Neil Warnock’s team-sheet wherever he manages says almost all you need to know about Derry. A real old-school enforcer, Derry marshalls the area in front of the back four with the subtlety of an entire rugby club out in town on a Saturday night, all dressed as Smurfs! He gained particular dislike amongst City fans following numerous fiery clashes with Crystal Palace during the 2008/09 and 09/10 season. Long been one of my most disliked players for a challenge on cult hero Junior Bent back in the early 90’s whilst playing for Oxford. Penney’s swinging elbow – you could actually see him looking at where to aim – broke Junior’s cheekbone in three places and kept him out of the game for some time, some argue he was never quite the same player again. Added to his notoriety in South Bristol by becoming manager of Rovers in January, but proceeded to nearly squeeze his way out of this XI by being so hopelessly inept that he took Rovers from mid-table to the bottom of the league and inevitable relegation. OK, OK, I do feel the need to qualify this one by saying it’s his playing career and early managerial career focussed on here. Even the most hard-nosed City fan would find it hard to not smile at his more recent, comedic moments in the spotlight, and he was on the receiving end of a Panto villain’s style booing during his last couple of visits to Ashton Gate, rather than the vitriol that has been a part of previous visits. But the fact remains he has blue & white blood running through his veins, and was the epitome of all we hated about Rovers some twenty years ago. Tough, abrasive, irritating, irksome, Holloway was the central cog and leader of that team and liked nothing more than to put one over on “the City”. One of those players who always, always seemed to play well and score against us. It may not even be true, history perhaps shading memories a certain colour, but I always remember when casting my eye over a team-sheet in the programme and seeing his name, thinking we’d be in for a tough afternoon. Another fiery player, he is also the first player I really remember who berated referees for every decision, went down ‘easily’ and was more than happy to waste time when it was to his benefit. If memories of Gabbiadini ‘always scoring’ are a touch vague, that is certainly not the case for ex- Walsall, Newcastle and Wolves (amongst others) striker Kelly. He did score every time we played against him, particularly during his early years at Walsall, when the most notable single moment of his career came. Kelly scored a hat-trick in a 4-0 win at the now-defunct Fellows Park, in a replay of an early version of the current play-off final. City’s record in play-offs remains wretched, with not a single success despite numerous attempts. I still blame David Kelly! My original list included Dean Windass for the single reason that his Wembley volley stopped City’s elevation to the Premier League, but in the time it took to write this out, King made certain of being the final name on the list. For the few of you not au fait with the situation, King served nearly a year at Her Majesty’s pleasure after being convicted of sexual assault and actual bodily harm. Now, I’m very much in the camp that people deserve a second chance once they’ve done their time, and although King now has fourteen separate offences to his name, I was slightly relieved when the Sky Blues offered him a contract last season. He scored twelve goals in the second half of the season to win over most of the critical fans, and then verbally agreed a three-year contract, apparently setting Coventry up with a platform and a goal-scorer they could build a team around. Then, this gentleman of a man, such a fine upstanding citizen, proved his character and demeanour by walking away at the flutter of more money and decided to repay Coventry’s significant faith in him by moving the short distance up the M6 to local rivals Birmingham. Steve Coppell was an obvious candidate having left us in the mire and walking out just three games into the season, but this particular spot has to go to Tony Pulis. Firstly, he’s a Gashead, having played for Rovers for eight seasons at the start of his career. Then, having achieved significant success with Gillingham – he was the manager when the Gills so nearly turned over Man City at Wembley – he arrived at Ashton Gate as the man to take us back to the second tier. He spent £400k on a striker called Steve Jones (who nearly made this list he was so bad), and signed ex-Rovers player Peter Beadle, playing a style of football that the nation’s fans have now become all too accustomed to. Only six months in and following rumours of a switch to Portsmouth, the home fans made him all too aware of where his future should lie. The team he left was probably the worst at Ashton Gate in the last 25 years. To make it all even worse, City was probably the only club he has taken backwards thus far in his career. I know not many ‘elevens’ would include a chairman, but Simon Jordan simply has to have a mention for his despicable behaviour following the non-allowing of a goal when Freddy Sears hit a shot that bounced back out from the stanchion, something only the referee and assistants seemed to fail to spot. Jordan demanded we offer them a replay, saying “if it was me I would have taken the moral high ground”, before going on to call the club “cheats”, “gutless”. Moral high ground…Simon Jordan….really? !